In order to allow an automated operation of a wood gas powered, combined heat and power plant, the moisture measuring instrument has been integrated into the clamshell of the transportation robot. After the drying process the wood chips with a target value of 10% moisture, the clamshell will forward the wood chips to the combustor. 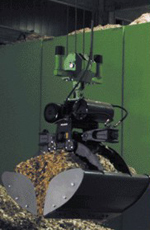 The accuracy of the measurement and the durability of the SensorHead are the decisive factors for the implementation of a MoistureScan, which, in an automated application, has to be able to handle constant movements in x-, y- and z-direction as well as frequent pressure changes due to squeezing and emptying of the clamshell.